Myplaycity.com is webpage that offers you to download and play various games for free. It contains games that are divided into such categories as Time Management, Racing, Puzzle, Action, Adventure, Shooting, Match 3, Sports, Arcade, and many more. The page also contains links to Google+, Facebook, and Twitter, and a search box that allows you to look for specific games. If you get redirected to this page, it could mean that you have an ad-supported program installed on your PC. If you want to eliminate Myplaycity.com from your browsers, you will have to uninstall its associated program. Although it is possible that Myplaycity.com has entered your computer when you installed some other software, you could have also agreed to this hijacker affecting your browsers yourself. 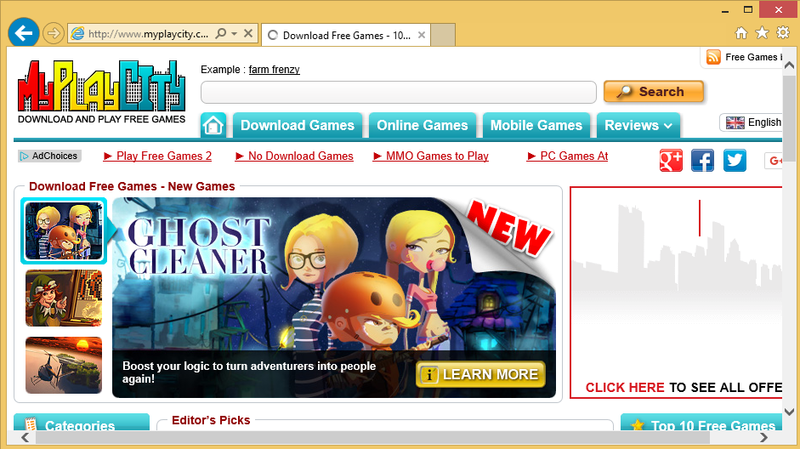 If you have downloaded games from this site, you may have been offered to replace your home page and default search provider with Myplaycity.com, Start.myplaycity.com, or Home.myplaycity.com. The last two websites slightly differ from the first one. They contain a search box with such search parameters as Web, Images, Video, and News. If you make use of the search box, you will be provided with relevant results, however, they will also contain sponsored links and ads. The main page contains advertisements as well. Moreover, various commercials may start appearing on all sites that you visit. We advise that you stay away from the advertisements that are brought to you by the hijacker. The reason for that is simple: they may be unreliable. The hijacker does not hold any responsibility for the commercial data that it shows to you in your browsers. You could be exposed to fake ads, clicking on which may result in various unwanted consequences including malware infections, financial losses, data disclosure, and more. There is no reason for you to take such risks. You should stay away from all ads until you get rid of Myplaycity.com for good. There are two ways you can eliminate Myplaycity.com from your browsers: manually or automatically. If you choose to go with manual Myplaycity.com removal, tt is possible that simply restoring your browsers will be enough, however, you may also need to uninstall potentially unwanted programs related to the hijacker (if there are any). After you complete manual Myplaycity.com removal, we advise that you scan your system with the reliable anti-malware scanner, which you can download from our site. If, on the other hand, you decide to terminate Myplaycity.com automatically, you will have to use a malware removal and prevention tool. The utility will scan your system, detect all potential issues, and remove Myplaycity.com along with them. In addition to cleaning your PC from various threats, it will also safeguard it from other Internet-based parasites you may encounter online.